New images by the Huuble and Spitzer space observatories show the farthest galaxy ever recorded as a diminutive blob that is only a tiny fraction of the size of our Milky Way galaxy. But it offers a peek back into a time when the universe was three percent of its present age of 13.7 billion years. The newly discovered galaxy, named MACS0647-JD, was observed 420 million years after the big bang, the theorized beginning of the universe. Its light has traveled 13.3 billion years to reach Earth. This find is the latest discovery from a program that uses natural zoom lenses to reveal distant galaxies in the early universe. 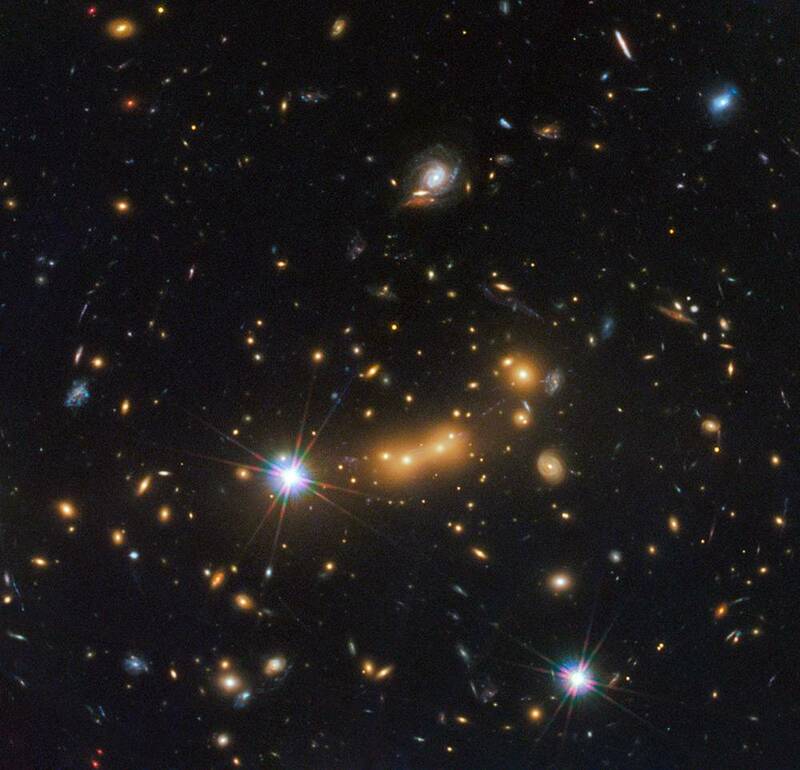 The Cluster Lensing And Supernova Survey with Hubble (CLASH), an international group led by Marc Postman of the Space Telescope Science Institute in Baltimore, is using massive galaxy clusters as cosmic telescopes to magnify distant galaxies behind them. This effect is called gravitational lensing. "This cluster does what no man-made telescope can do," said Postman. "Without the magnification, it would require a Herculean effort to observe this galaxy." ACS0647-JD is so small it may be in the first steps of forming a larger galaxy. An analysis shows the galaxy is less than 600 light-years wide. Based on observations of somewhat closer galaxies, astronomers estimate that a typical galaxy of a similar age should be about 2,000 light-years wide. For comparison, the Large Magellanic Cloud, a dwarf galaxy companion to the Milky Way, is 14,000 light-years wide. Our Milky Way is 150,000 light-years across. "This object may be one of many building blocks of a galaxy," said the study's lead author, Dan Coe of the Space Telescope Science Institute. "Over the next 13 billion years, it may have dozens, hundreds or even thousands of merging events with other galaxies and galaxy fragments." The CLASH team identified multiple images of eight galaxies lensed by the galaxy cluster. Their positions allowed the team to produce a map of the cluster's mass, which is primarily composed of dark matter. Dark matter is an invisible form of matter that makes up the bulk of the universe's mass. "It's like a big puzzle," said Coe. "We have to arrange the mass in the cluster so that it deflects the light of each galaxy to the positions observed." The team's analysis revealed that the cluster's mass distribution produced three lensed images of MACS0647-JD at the positions and relative brightness observed in the Hubble image. Coe and his collaborators spent months systematically ruling out these other alternative explanations for the object's identity, including red stars, brown dwarfs and red (old or dusty) galaxies at intermediate distances from Earth. They concluded that a very distant galaxy was the correct explanation. 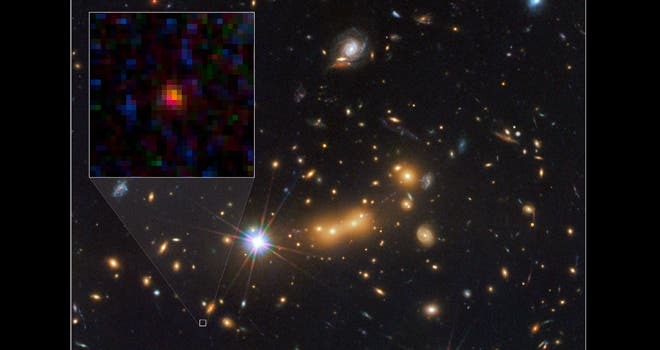 MACS0647-JD galaxy, however, may be too far away for any current telescope to confirm the distance based on spectroscopy, which spreads out an object's light into thousands of colors. Nevertheless, Coe is confident the fledgling galaxy is the new distance champion based on its unique colors and the research team's extensive analysis. The new distance champion is the second remote galaxy uncovered in the CLASH survey, a multi-wavelength census of 25 hefty galaxy clusters with Hubble's ACS and WFC3. Earlier this year, the CLASH team announced the discovery of a galaxy that existed when the universe was 490 million years old, 70 million years later than the new record-breaking galaxy. So far, the survey has completed observations for 20 of the 25 clusters.